Your initial visit with us is only $29! Enter your information below to schedule your next appointment! Here at Hess Chiropractic we are a group of dedicated professionals that provide you with excellent chiropractic care for any issues you may be facing. 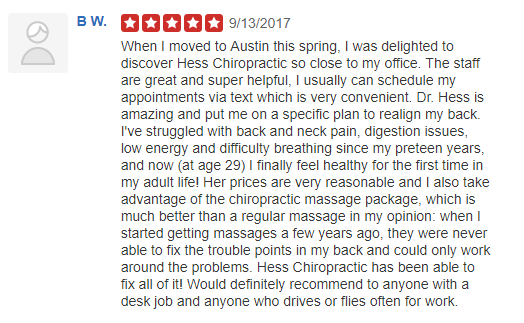 Our Austin chiropractor, Dr. Amy Hess, offers customized treatments for a variety of issues ranging from pediatric care, to chronic back issues. We provide you with exemplary service that you won't find any place else!